Longtime Palms Hotel Casino chef Barry Dakake is the definition of a survivor. Sizzling seconds away from being hot off the grill. The Spazz Salad, one of the many holdovers from N9NE Steakhouse. It was formerly known at the Garbage Salad. Chef Barry Dakake with ready-for-grilling filet mignon. 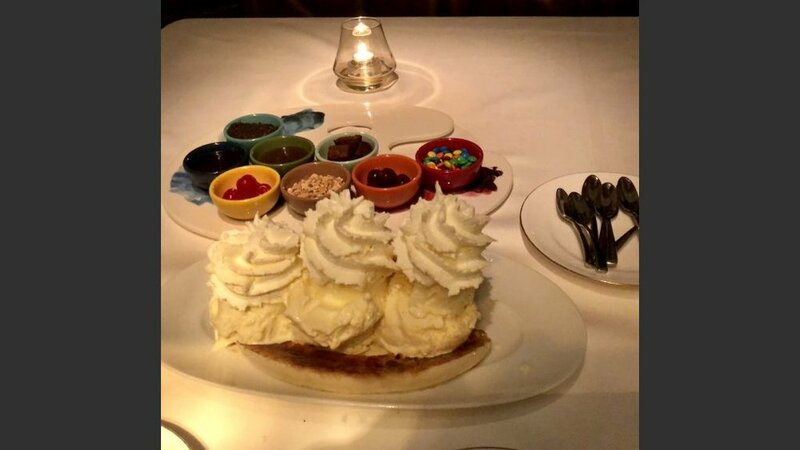 The tableside Banana Split with eight toppings, including mini cubes of Brownies, and melted chocolate and caramel. He’s weathered major medical crises, ownership changes and watched his once-dominant steakhouse fall out of favor. Like a cat with nine lives, the former executive chef of N9NE Steakhouse is on the rebound again, thanks to the Fertitta brothers, Frank and Lorenzo. The Rhode Island native knows something about comebacks. In the mid-1990s, he overcame stage 3 Non-Hodgkin’s Lymphoma, a form of cancer that begins in the lymphatic system. Less than 10 years later he had a viral tumor in his spinal cord. 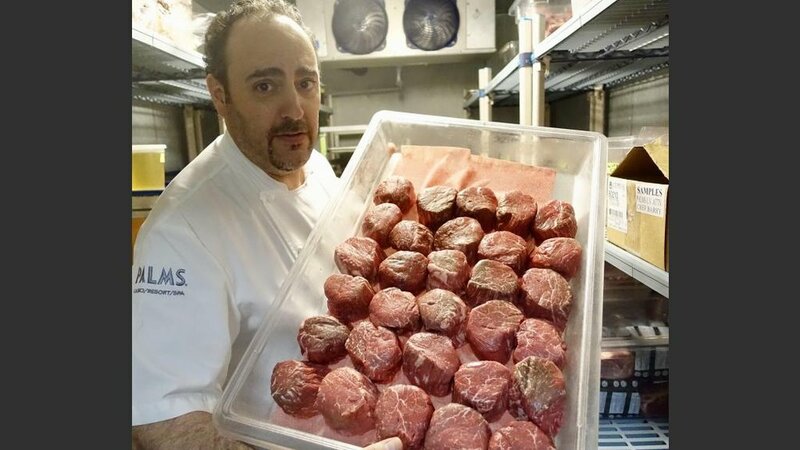 During an interview this week, he shared his thoughts about how he ended up back at the Palms, the death of superchef Joel Robuchon, and why he’s boycotting Canada. What kind of a relationship did he have with the Fertitta brothers before the purchase? What kind of pressure was he feeling before being hired? “Jon Gray (chuckle) really pulled for me and spoke very highly of me.” Gray had worked at the Palms and Caesars Entertainment’s The Linq promenade project before moving to Nike’s corporate office in Portland in late 2014. UFC president Dana White “really pushed for me, too. With him coming from Massachussetts and me from Rhode Island, we hit it off from Day One." The best meal he ever had?